American expat Claire Ptak is baking Meghan and Prince Harry’s royal wedding cake! In honor of that, we’re sharing one of her perfect summer recipes, Cardamom Rhubarb Shortcakes, and sharing a little bit about her. In a large bowl, sift together flour and baking powder; stir in sugar and salt. Cut butter into small pieces, and rub through dry ingredients with a pastry cutter, the back of a fork, or your fingers, or use an electric mixer or food processor. Any which way you like to get a coarse, crumbly result. Pour cream over top, and stir with a wooden spoon until just combined. Turn out dough onto a lightly floured surface, and press together into a block. Let dough rest for 5 minutes. When ready, roll dough to 1-inch (2½-centimeter) thickness, and use a 2¼-inch (6-centimeter) round pastry cutter to stamp out even rounds, but try not to handle the dough too much. Transfer shortcakes to prepared pan. Cover with cling film (plastic wrap), and refrigerate or freeze for 10 to 20 minutes. This will help the shortcakes keep their shape while baking. Bake for 18 to 25 minutes, depending on their size. Remove shortcakes from oven, and transfer to a wire rack to allow them to cool completely. 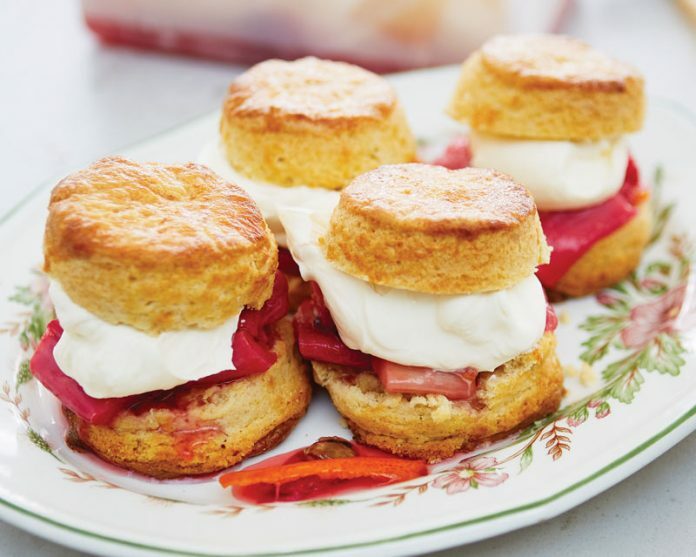 To serve, split shortcakes in half, spread with Roasted Rhubarb, and fill with cream. Preheat oven to 350°F (180°C). Line a baking tray with parchment paper. Cut rhubarb, and place in a single layer on prepared pan. Sprinkle with sugar, and add remaining ingredients. Cover with foil. Roast for 10 to 20 minutes. Uncover and roast until rhubarb retains its shape but is almost jammy, about 10 minutes more.